Brief Synopsis – A father explains the experience of arranging a wedding for his daughter. My Take on it – I never saw this movie before, but was quite familiar with the storyline due to its remake 40 years onward. I believe that this movie works much better in the emske as a comedy with some drama than as a drama with some funny lines, but it was enjoyable watching Spencer Tracy give another excellent performance. The premise is very good and it’s the kind of story that many people can easily relate to. 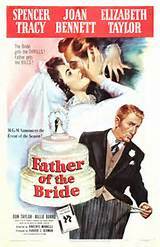 What surprised me the most was the fact that this movie was among the 5 noninees for Best Picture in 1950. This movie is good, but the idea that it could be counted amongst the best 5 movies of the year says either a lot about the quality of most of the movies released that year or that people saw this movie in a completely different light back then than one can these days because of so nany scientific advances. Bottom Line – Seems to lack enough bits of humor to make it more appealing. The premise and acting is very good. Surprised that this movie was one of the 5 Best Picture Nominees that year. Feels slightly dated solely because so much has changed in 60+ years. Recommended!